I know we are still on the topic of pre-start but as with any big project success is all in the planning. 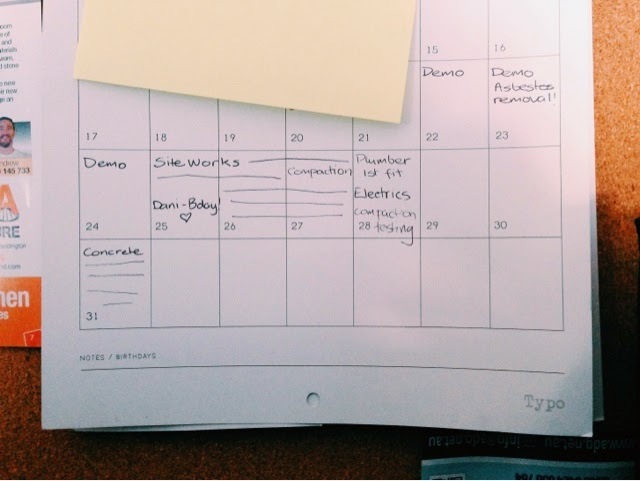 My organised chaos and how we like to plan. Completely old school with an actual real live pin board (take that Pinterest). You might also notice it was my birthday the other day I turned 25 for the fourth year in a row. 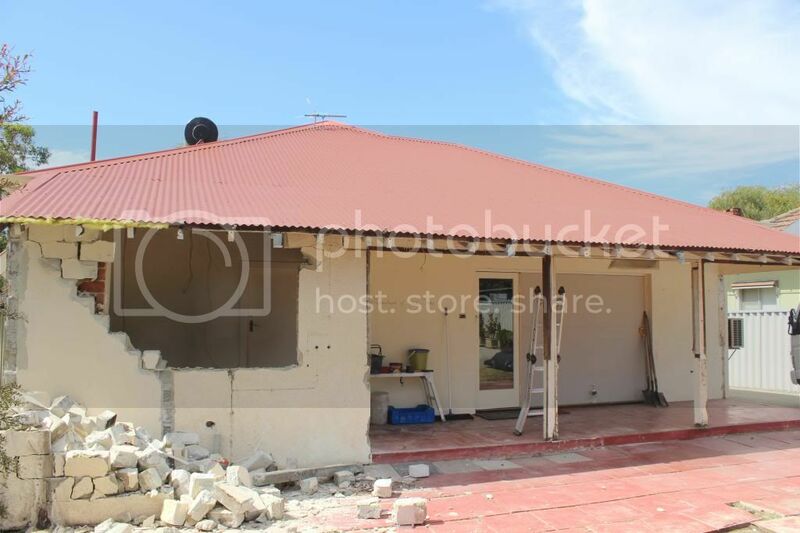 As we are hoping to minimize the disruption to the rest of the house and continue living here while the build is going on it has been really important that we have the house prepared so that can happen. If you are planning your own major renovation project whether you can remain in the house or not should definitely be considered as the cost of possibly renting short term elsewhere can get expensive and eat into your budget. OK cool we can do that, it sounds easy enough RIGHT?? Chatting to a friend who happens to have a building company (building amazing homes sadly wayyyy out of our price range), she offered some interesting insight into why it is so hard to get quotes. Apparently a trades person will more than likely always favor a bigger repeat customer (a professional builder or building company)over a smaller one time job with a little guy like us. Smaller guys like owner builders also want a fixed up front price for the job (for obvious reasons) but as we are quickly learning this is hard to do as there can be so many unknowns that pop up along the way and blow out the time frame. OK that's fair enough, they have got to look out for their bigger clients first as they are the ones who keep the paycheck rolling in week to week and we probably drive them crazy with our need to exact fixed pricing. Still this doesn't really help us out too much in the meantime. This unfortunately has been a big reason for delays in our start up but we have learnt a few things along the way that I wanted to share. 2. Persevere with getting several quotes, even if it pushes your timeline out further. We had one quote for steel we thought was quite good only to have one come in at the 11th hour that is MUCH better - like a few 1000$ better. 3. Go with your instincts about a trades person/ trade company if they seem disinterested, if they cancel quoting site visits, if they don't return your calls in a reasonable time frame etc you probably don't want to work with them. 5. If you are fortunate enough to get some great trades on your job ask them for recommendations for other complementary trades you might need. A lot of these contractors work together on the same jobs so know who they like to work with. Our concrete polisher recommended a concreting company who we are now using. They are not the cheapest (or the most expensive) but they were the most professional and clearly take pride in the work they do. As the flooring is a big part of our budget we want it to look amazing. 6. If you want things to run smoothly (and this could be a no brainer sorry) make sure that you have all your major starting trades scheduled in locked and loaded BEFORE you start smashing down walls. Thanks for the insight Dani! The partner & I will be embarking on a major renovation of our house in a couple of years and it sends shivers down my spine just thinking about having to chase up tradies! Good Luck it will be worth it in the end! Thanks Sam, I hope I don't scare you too much, its a bit of a pest but with perseverance I am sure you will end up with some fantastic tradies on your job. Demolition is my favourite part. I was caught pulling down the back fence in my pi's last week. It was very cathartic! Look forward to reading the next post. 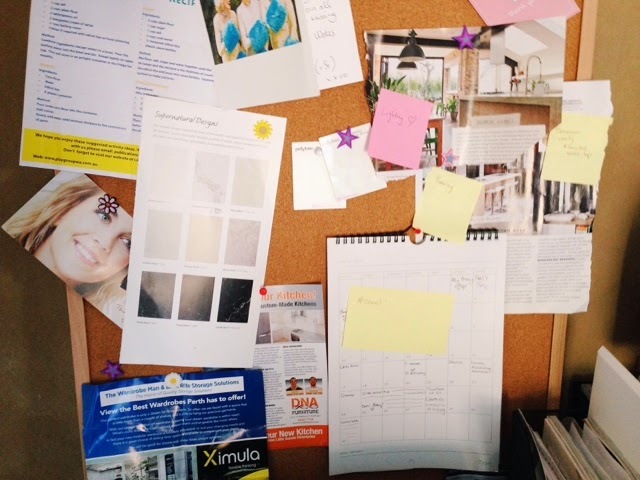 Hi Dani, I think people can vastly underestimate all the work that needs to go into such things - it's a HUGE thing to do a renovation, unlike the half hour shazams that TV shows produce - I am loving these posts about what goes into a project like yours. Keep it up! And photos aren't everything! So true Annette, the renovation shows on TV make it look like a breeze (even if they do complain a lot on camera) but there is so much more that goes into it all. We knocked the back off our house a while back and lived in and around the works with 3 kids under 5yrs - MADNESS! I asked the Mr to take a photo of me washing dishes in the ensuite sink and placing them to dry on a tea-towel in front of the toilet so that when I suggested we would live-in next time he could remind me what it was really like! Saying that I would probably live in again. Love that post Dani, can't wait to see what happens next, well done! Haha I am taking on more of a supervisory role right now so not on the end of the old sledge hammer all that much.